This book draws on the stories of female educators and young Muslim women to explore issues of identity, justice and education. 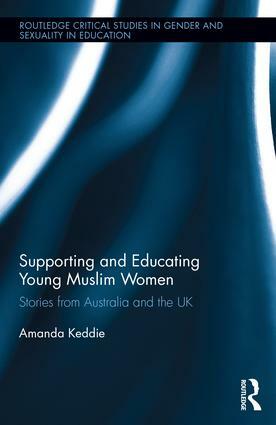 Situated against a backdrop of unprecedented Islamophobia and new articulations of ‘White-lash’, this book draws on case study research conducted over a ten-year period and provides insight into the diverse worlds of young Muslim women from education and community contexts in Australia and England. Keddie discusses the ways in which these young women find spaces of agency and empowerment within these contexts and how their passionate and committed educators support them in this endeavour. Useful for researchers and educators who are concerned about Islamophobia and its devastating impacts on Muslim women and girls, this book positions responsibility for changing the oppressions of Islamophobia and gendered Islamophobia with all of us. Such change begins with education. The stories in this book hope to contribute to the change process. Amanda Keddie is Professor of Education within REDI (Research for Educational Impact) at Deakin University, Australia. Routledge Critical Studies in Gender and Sexuality in Education showcases scholarly work over a wide range of educational topics, contexts and locations within gender and sexuality in education. The series welcomes theoretically informed scholarship including critical, feminist, queer, trans, postcolonial, and intersectional perspectives, and encourages creative and innovative methodological approaches. Proposals dealing with critical policy analysis, as it relates to gender and sexuality studies in education, are also invited. The series is committed to publishing scholarly monographs, both sole and co-authored, and edited collections. Please send inquiries and proposals to: Wayne Martino (wmartino@uwo.ca), Emma Renold (Renold@cardiff.ac.uk) and Matthew Friberg (matthew.friberg@taylorandfrancis.com).